Ali, his eight brothers and sisters and his mum came to Australia in 2001. Living in a three-bedroom, one-bathroom house things were strained or as Ali says, ‘My life was hell, we would always fight, we had no privacy and it got so bad my brother started to sleep in the kitchen’. In 2011 Ali suffered ongoing medical conditions which led to him missing two terms of school. School became too much for him. Ali started running away from home, sometimes not coming back for days which led to him missing a term of school. Ali’s school Principal had even said to Ali’s mum that he should consider dropping out of school. Ali was determined to prove the Principal wrong. 2013 saw Ali and his brother Mohammed receive a two-bedroom Kids Under Cover studio. That’s when life really started to turn around for Ali. 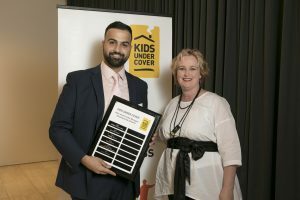 Following the studio, Ali received four Kids Under Cover scholarships which he used to buy food and take public transport to and from university. Ali always wanted to be a lawyer when he grew up, however, his teacher had told him his English skills might not be strong enough for such an ambition…. boy was he wrong! When Ali was asked what achievement he is most proud of he said ‘being accepted as a Juris Doctor Student at the University of Melbourne in 2017, this was the pinnacle all my studies up until that point were working to achieve this’. Ali plans to use the Ken & Lenka Morgan Scholarship to purchase a number of textbooks he has been unable to purchase due to his family’s financial difficulties. He also plans to take part in traineeships and events such as Mooting Competitions. In 2019 Ali plans to use some of the funds from the scholarship to partake in an international subject as part of his degree. Congratulations Ali – the 2019 Ken & Lenka Morgan Scholarship recipient!